Bio Notes: William Tite was born in London on 7 February 1798, the son of Arthur Tite, a wealthy merchant. He was articled to David Laing in 1812, admitted to the Royal Academy Schools in 1818 and was largely responsible for Laing's St Dunstan-in-the-East Church as early as 1817-20. His independent career took off with the commission to design Mill Hill School in 1825, and in 1832 he married an heiress, Emily Curtis. He was President of the Architectural Society in 1838 until it merged with the RIBA in 1842. For some years he was in partnership with Edward Norton Clifton after 1839 but the dates have not been clearly established. Tite's Scottish practice arose mainly from his pioneering work as a railway architect. In July 1846 he offered his services to the Caledonian Railway, and his offer was accepted. He visited Glasgow on 14 October and produced a detailed report on what was required on 27 May 1847. Work proceeded on a number of stations, but of the two main termini, Dunlop Street, Glasgow was never built and at Lothian Road, Edinburgh only the train-shed was built in shortened form. As Tite's health failed, much of the work was carried out by his chief assistant Ebeneezer Trotman. Relations between the Caledonian Railway and Tite began to break down from January 1850 when Tite's fees amounted to £6,181 8s 3d of which £2,024 18s 6d had been paid and the Company was unable to meet the balance. Tite succeeded in obtaining his fees as a result of a Court of Session decision on 5 February 1851, but his Scottish practice was at an end. Tite visited Italy in 1851-52 to recover his health. 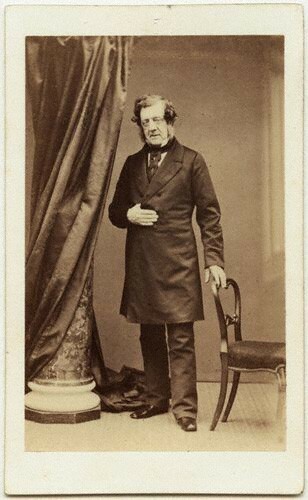 He gradually withdrew from practice and entered politics as Liberal MP for Bath from 1855. He was RIBA Gold Medallist in 1856 and President of the RIBA 1861-63 and again in 1867-69, his presidency ending with a knighthood. He died at Torquay 20 April 1873 leaving moveable estate of just under £400,000 ('I inherited a fortune, I married a fortune and I have made a fortune'). Builder 13 January 1950 Issue for 13-20 January 1950. Article by M S Briggs.